Celebrating the 40th anniversary of this restored film, including the original scenes filmed in Edwardsville with additional never-seen-before Director’s shots. Attending the screening will be Director Richard Taylor, hero star Les Lannom, villain star Bert Hinchman, and character actor Will Shaw. 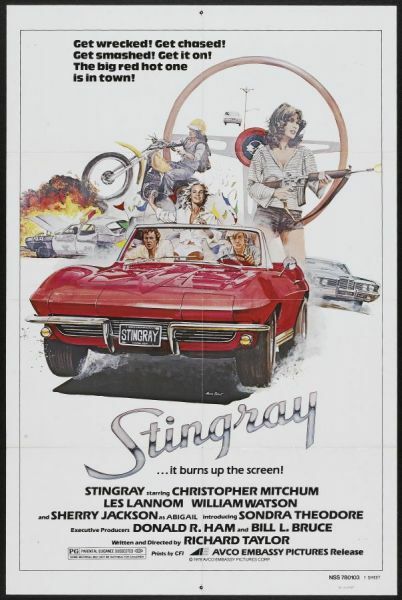 Two drug dealers try to track down their million bucks and the drugs, which they stash in a red Corvette Stingray in a used car lot only to find out that the car has been sold. Lots of mistaken identities and car chases through Edwardsville. You will recognize Main Street, the old A&W, the former Cassens Car Lot, 2nd Street, the County Courthouse, and a corvette making a high-speed chase across City Park, just missing the library.